A canvas with an irrational depiction of reality “Paranoid – critical loneliness” belongs to the surrealist Dali. The date of the appearance of the picture is connected with the established style of the artist’s letter and the perfect conviction of the latter in his own genius. The title of the work fully reflects the already well-known method of research and writing of own canvases by Salvador. The author called his “invention” as paranoid – a critical method based on the depiction of those objects and images that, in his opinion, took place solely in dreams or narcotic dope of a person. These are the very scenes of bullying and pieces of bodies that rational thinking simply can not think of, neither perceive nor portray. Consequently, Dali called his method of irrational thinking authorial and having the right to exist in world painting. And so, the presented work is the personification of some lonely-sad thoughts of Dali. It is possible that the car, and the remains of the sawn wood, and the flowers that cover the pieces of metal, are in some way connected with the moments of the artist’s life. However, the moment associated with the car, froze in the minds of the young Salvador of Figueras. We can only assume that transportation is associated with a certain journey, perhaps a dream of escape. This event was so old that it was overgrown, as we say “moss” of time. In this case, the notorious “moss” – this is an ordinary small inflorescences and grass. The path to which the traveler was heading was a long one, dotted with rocky ridges and sands. That road was imprinted so intensively in memory that it left a deep mark in the stone of consciousness and time – here it is, that silhouette of the car on the left, in the rock. The loneliness with which the author linked his work was expressed in a simple transfer through the rusting metal of the machine, the destroyed wall, the dead tree, represented by a pitiful stump. There was no one to wash the car, to whitewash the wall and water that tree. Here it is – the result of cold loneliness. Salvador Dali painted the painting in his usual manner. This is an abundance of air, space, voids and an infinite horizon. These are warm colors with an admixture of yellowness of the sky, white cumulus clouds. These are sharp shadows and lack of glare due to the presence of dust on objects. The author’s letter is beautiful, clear, smooth. His irrational behavior and design compensates for the scrupulous approach to small-scale drawings. Along with the chaos of thoughts in Dali’s work, the accuracy of the perspective, the laws of chiaroscuro, the genuine display of objects, is getting along. Like two different people exist in a single shell, as the first sign of schizophrenia. 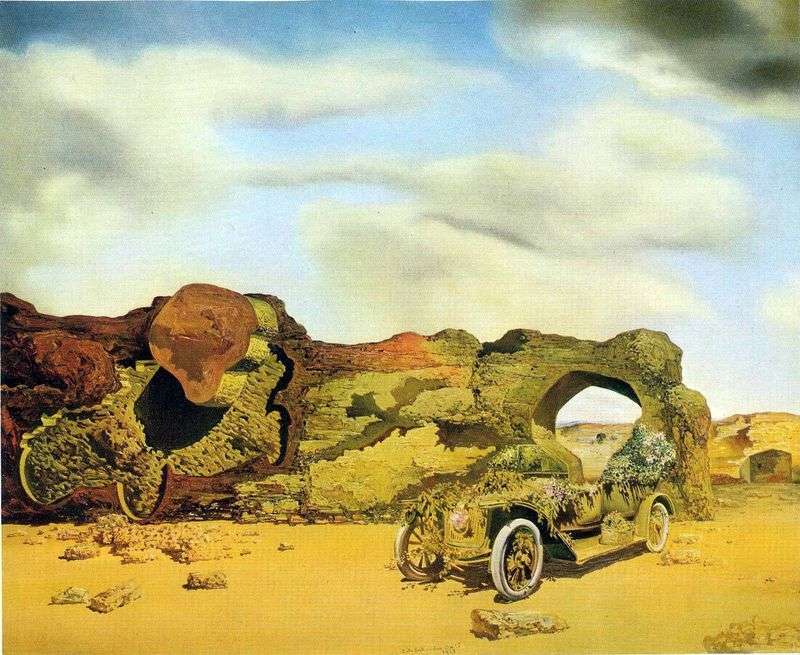 Description and meaning of the painting Paranoid-critical loneliness by Salvador Dali.